This antibody binds to CXCR 4 receptor on mouse spleen leukocytes as determined by immunocytochemistry. Our Abpromise guarantee covers the use of ab1670 in the following tested applications. Receptor for the C-X-C chemokine CXCL12/SDF-1 that transduces a signal by increasing intracellular calcium ions levels and enhancing MAPK1/MAPK3 activation. Acts as a receptor for extracellular ubiquitin; leading to enhance intracellular calcium ions and reduce cellular cAMP levels. Involved in haematopoiesis and in cardiac ventricular septum formation. Plays also an essential role in vascularization of the gastrointestinal tract, probably by regulating vascular branching and/or remodeling processes in endothelial cells. Could be involved in cerebellar development. In the CNS, could mediate hippocampal-neuron survival. Acts as a coreceptor (CD4 being the primary receptor) for HIV-1 X4 isolates and as a primary receptor for some HIV-2 isolates. Promotes Env-mediated fusion of the virus. Expressed in numerous tissues, such as peripheral blood leukocytes, spleen, thymus, spinal cord, heart, placenta, lung, liver, skeletal muscle, kidney, pancreas, cerebellum, cerebral cortex and medulla (in microglia as well as in astrocytes), brain microvascular, coronary artery and umbilical cord endothelial cells. Isoform 1 is predominant in all tissues tested. Defects in CXCR4 are a cause of WHIM syndrome (WHIM) [MIM:193670]; also known as warts, hypogammaglobulinemia, infections and myelokathexis. WHIM syndrome is an immunodeficiency disease characterized by neutropenia, hypogammaglobulinemia and extensive human papillomavirus (HPV) infection. Despite the peripheral neutropenia, bone marrow aspirates from affected individuals contain abundant mature myeloid cells, a condition termed myelokathexis. The amino-terminus is critical for ligand binding. Residues in all four extracellular regions contribute to HIV-1 coreceptor activity. Phosphorylated on agonist stimulation. Rapidly phosphorylated on serine and threonine residues in the C-terminal. Phosphorylation at Ser-324 and Ser-325 leads to recruitment of ITCH, ubiquitination and protein degradation. Ubiquitinated by ITCH at the cell membrane on agonist stimulation. The ubiquitin-dependent mechanism, endosomal sorting complex required for transport (ESCRT), then targets CXCR4 for lysosomal degradation. This process is dependent also on prior Ser-/Thr-phosphorylation in the C-terminal of CXCR4. Also binding of ARRB1 to STAM negatively regulates CXCR4 sorting to lysosomes though modulating ubiquitination of SFR5S. Sulfation on Tyr-21 is required for efficient binding of CXCL12/SDF-1alpha and promotes its dimerization. O- and N-glycosylated. Asn-11 is the principal site of N-glycosylation. There appears to be very little or no glycosylation on Asn-176. N-glycosylation masks coreceptor function in both X4 and R5 laboratory-adapted and primary HIV-1 strains through inhibiting interaction with their Env glycoproteins. The O-glycosylation chondroitin sulfate attachment does not affect interaction with CXCL12/SDF-1alpha nor its coreceptor activity. Cell membrane. In unstimulated cells, diffuse pattern on plasma membrane. On agonist stimulation, colocalizes with ITCH at the plasma membrane where it becomes ubiquitinated. 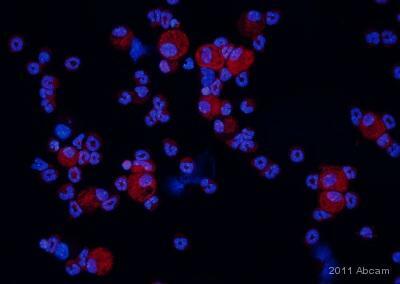 Immunocytochemistry/ Immunofluorescence analysis of mouse bronchoalveolar lavage cells labeling CXCR4 with ab1670 at 1/200 dilution. Cells were fixed in formaldehyde and permeabilized with 1% triton X100 for 5 minutes. 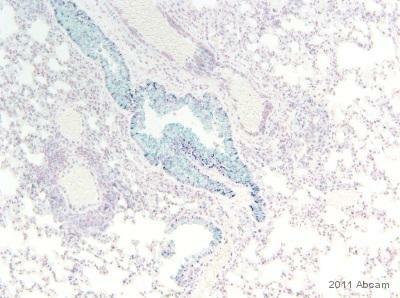 A polyclonal rabbit anti-goat Alexa Fluor® 594 secondary antibody was used at 1/300 dilution. 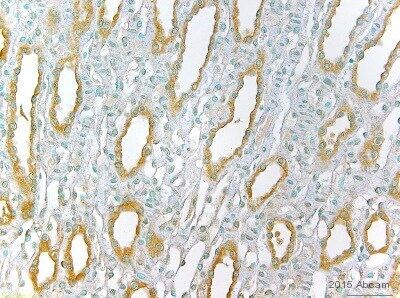 Immunohistochemistry (Formalin/PFA-fixed paraffin-embedded sections) - Anti-CXCR4 antibody (ab1670)This image is courtesy of an abreview submitted by Dr Robert Berahovich. Immunohistochemistry (Formalin/PFA-fixed paraffin-embedded sections) analysis of mouse fetal brain tissue labeling CXCR4 with ab1670 at 4 µg/ml. Tissue was fixed in formaldehyde; 1%BSA was used to block tissue for 30 minutes at 25°C. Heat mediated antigen retrieval was performed using a citrate buffer. A polyclonal rabbbit anti-goat IgG Biotin conjugated secondary antibody was used at 1/500 dilution. A good staining of neural cells was observed. Flow Cytometry - Anti-CXCR4 antibody (ab1670)This image is courtesy of an abreview submitted by Dr Francois Daubeuf. 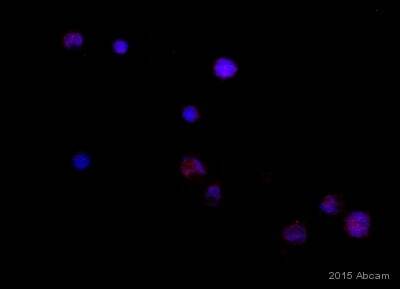 Flow Cytometry analysis of cells from mouse bone marrow (C57b6) labeling CXCR4 with ab1670 at 1/50 dilution. 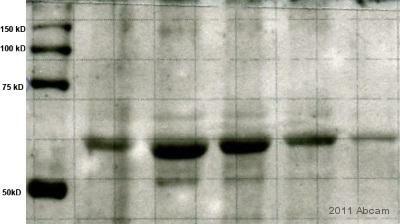 A polyclonal dobkey anti-goat DyLight® 649 secondary antibody was used at 1/1000 dilution. Bone marrow from Femur was extracted with PBS-EDTA 3mM, 2 hours before flow cytometry analysis. Cell population was gated on live cells (DAPI-), blood cells were excluded. Immunohistochemistry (Formalin/PFA-fixed paraffin-embedded sections) - Anti-CXCR4 antibody (ab1670)This image is courtesy of an Abreview submitted by Francois Daubeuf.